An English club will be in the semi-finals of the Women's Champions League after Birmingham were drawn against Arsenal in the quarter-finals. Birmingham will have home advantage in the first leg on 22 or 23 March. Arsenal reached the quarter-final stage with a 6-2 aggregate win over Glasgow City while Birmingham knocked out Russian side FK Zorkiy Krasnogorsk. 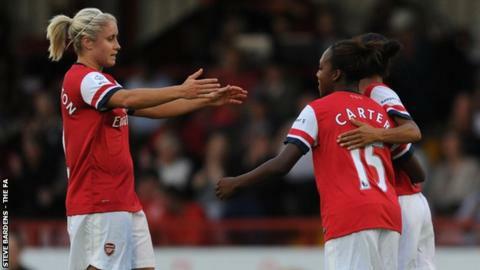 "If I'm being biased you'd want both teams to avoid each other," said Arsenal Ladies manager Shelley Kerr. "But one good thing is that there's not much travelling involved. It'll obviously be an exciting game for the neutrals." Birmingham City Ladies manager David Parker said: "The chairman will be buzzing with the draw with the finances involved. We've lost a lot of money travelling to Russia and Helsinki so it'll be a good thing for the football club. "The whole point of it being the Champions League is the travelling and testing yourself against the best in the world but it's good for English football that we have two clubs still in there." The winners will play Tyreso FF of Sweden or Austria's SV Neulengbach.